Mr. Mugs is a sheep dog who was featured in these readers I used when learning how to read. Mr. Mugs taught me to read, and since he's no longer part of the Canadian school curriculum, I preserved him for all of eternity. Ranking #2 in Google for Mr. Mugs results in lots of interesting emails like the one below from Patrick. I am not from Canada (from the states) and am assuming that Mr. Mugs was a Canada specific series of books. 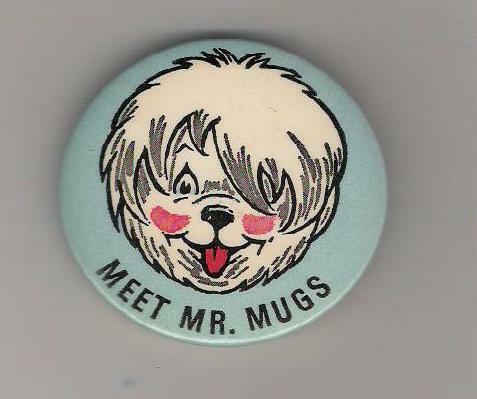 I found your site because I googled " mr. Mugs" as I have a button with his name on it that my grandparents had in the bottom of an auction box they purchased maybe 15 years ago.. it has been stuck in a bulletin board in my classroom (I teach) for years now, and I have been trying to find out what on earth Mr Mugs is! Here's the button Patrick found. If you remember Mr. Mugs, you'll get a kick out of this. Yeah I remember.. and I'm pretty sure my little brother who's about 8 yrs old read them in school so I have no idea why you think the series is no longer in schools..
Mr. Mugs left the Toronto Catholic board over 20 years ago. I'll bet your brother wouldn't know Mr. Mugs - show him the pic and let us know. Boxes of Mr. Muggs in my school still..........no one wants to part with them! I guess I should clarify, I already know my little brother knows who Mr. Mugs is. I'll place a call and find out how. He might have picked up some of my old books that my mother kept, I know he's got into my Gordon Korman ones. He lives in way up north with his folks, I won't be able to show him the pics for weeks. Sidenote- Does anyone remember Gordon Korman who wrote Bruno and Boots? You know, I think I might be wrong. I think he knows Clifford The Big Red Dog. Muggs has been out of schools for YEARS although I am willing to bet they have been used in some schools by some "old school" teachers! I love Gordon Korman books and read them in school and I know they are still in my school library right now as I saw one on the table the other day! I had totally forgotten about them! Were they not written by someone in Toronto? I love the Old Clifford books..........the new ones, much like the new Franklin are annoying! They are written to be a tv show with too many characters in them! what a shame. who can resist a sheep dog. i'll find out tomorrow for sure, but i think it's clifford my brother knows. I am willing to bet it is Clifford too if he is only 8! Mr. Muggs would have to be well hidden to be used in a school here in Ontario today! I am going to have to dig out an old Gordon Kormon book and read it over the holidays! It was late 80s when they came out I think! Gordon Korman was my first favourite author. Reading that entry brought it all back to me. I have a signed copy of one of the books, not sure which in the series it is. If I remember correctly, he came to our school to sign books.. something like that. Hello Mike, I have been reading this post with interest since I am a Mr. Mugs fan as well. I am actually looking for another reader from way back in the day. It was a hardcover with teal background and one of those circular space stations on the front. In my frustrated searches (all the Canadian textbook publishers have been bought by the American ones), I have discovered the National Archives of Canada. It looks as though they have a the Mr. Mugs books in their collection and one may purchase a reproduction. I am not 100% sure about this. I hope to chat with someone today to confirm it. But if this is correct, many people who love these books may have a chance to hold them again. i will keep you posted. My husband grew up with Mr. Mugs. It was the first children's book he was introduced to during his childhood. We are awaiting an old English Sheepdog puppy and have decided to name him "Mr. Mugs"
I am also trying to get my hands on Mr. Mugs books to introduce the original Mr. Mugs to our children. Seems like Mr. Mugs is now a collectors' item! Mr. Mugs.. I remember when he (the stuffed version) was lost and my whole Grade 2 class went on a walkabout in the school neighbourhood to find him... and find him we did - sitting on a classmate's porch Didn't know that Mr. Mugs was so uniquely Canadian... makes the memories so much more precious. Thanks for preserving him but I would like him back .. he was great!